"This is a Model 50X and has a 25 quart liquid capacity.The heating element on the 50X is the larger 1650 watt element and has a 50% faster startup time and 36% greater heating capacity than the 25X model This sterilizer comes with the standard manufacturers 1-Year Warranty. These sterilizers have been made since 1930 and there are several million in service all over the world. Includes all standard accessories, literature and instructions. This is a professional grade sterilizer and is perfect for all General Medical, Dental, Chiropody, Veterinary, Laboratory, Tattooing, Body Piercing, Health, Nail and Cosmetic applications. You will not find a higher quality sterilizer at this price anywhere. 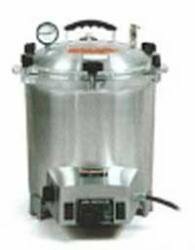 This is an FDA Listed and UL Approved autoclave."